Paul Dorion (Montreal, Canada) notes on a CNN webpage a fine photograph of Ray Charles (1930-2004) with a Braille chess set. 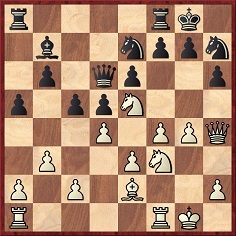 In October 2017 Michael Clapham’s website Chess Book Chats (mentioned in C.N. 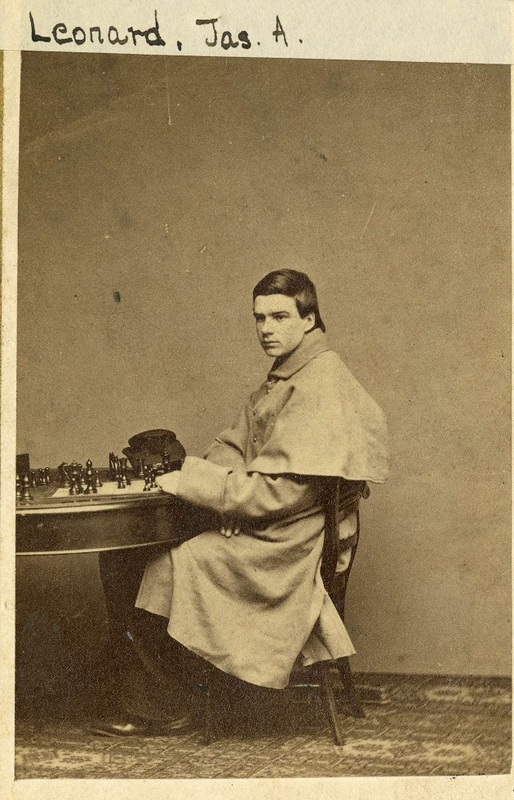 10089) had excellent items on Bobby Fischer and William Lombardy. 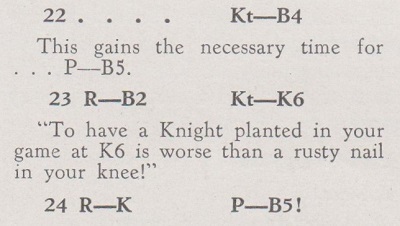 The present item may be read in conjunction with A Knight on K5, K6 or Q6. A number of bottom-of-the-range Internet pages sourcelessly ascribe such a remark to Bogoljubow, the square occupied being given as e6/e3. 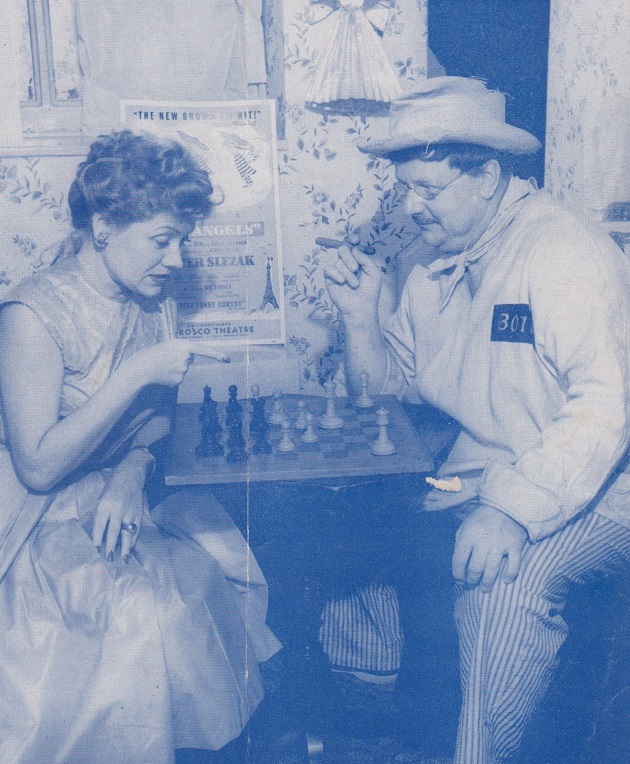 Source: page 170 of The Delights of Chess by Assiac (London, 1960). 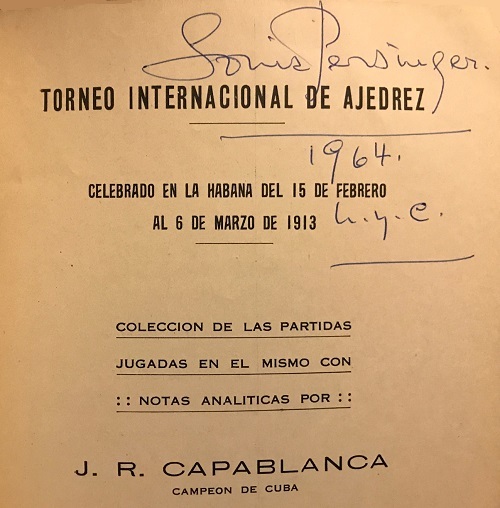 For a more specific, and less flattering, assessment, see Harry Golombek’s Book on Capablanca. 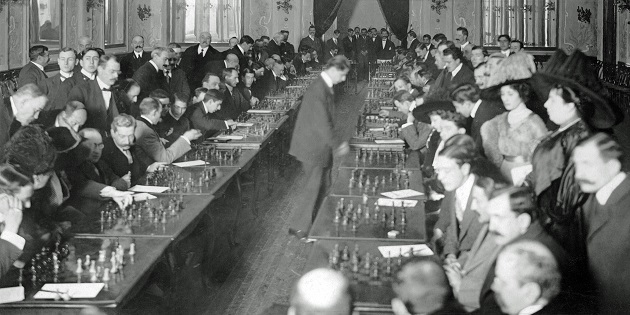 Richard Reich asks whether any solid biographical information is available about Ernest Hemingway’s interest in chess. 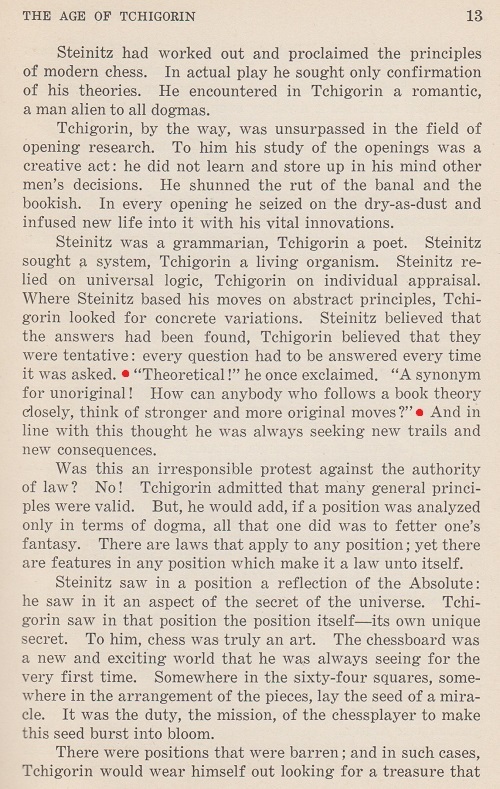 How much of Fred Reinfeld’s passage below, concerning Steinitz and Chigorin, can be corroborated? 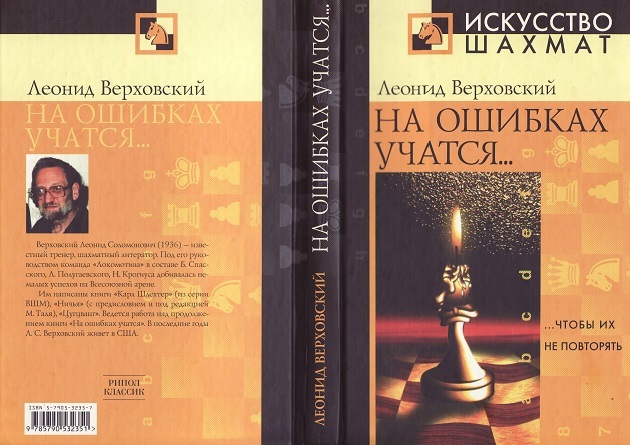 The source is Reinfeld’s book The Great Chess Masters and Their Games (subtitle: ‘The Human Side of Chess’). 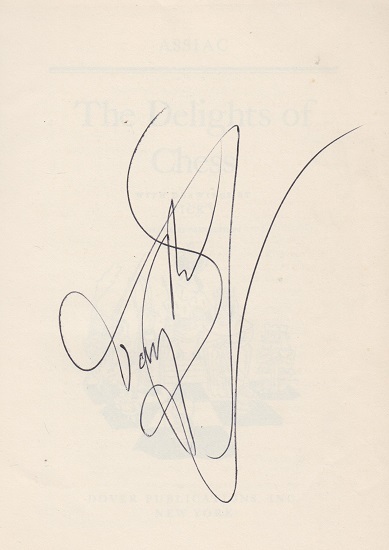 See pages 109-110 of the original US edition (New York, 1952) and page 113 of the UK edition (London, 1953). 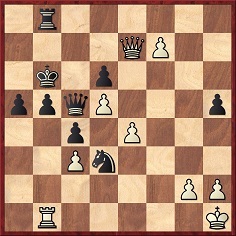 26...Rf7 27 fxe7 Rh7 28 Qf6 dxe3 29 Ng5 Qxh2 mate. 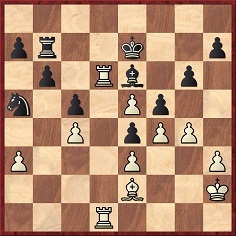 31 Rxe6+ Kxe6 32 gxf5+ gxf5 33 Rd6+ Ke7 34 Rh6 Kf8 35 Rh5 Rf7 36 e6 Rf6 37 Rxh7 Rxe6 38 Rxa7 Rh6 39 Bf1 Rd6 40 h4 Rd2+ 41 Kg3 Ra2 42 h5 Rxa3 43 h6 Rxe3+ 44 Kh4 Kg8 45 Bh3 Rxh3+ 46 Kxh3 Nxc4 47 Kh4 Nd6 48 Kg5 Nf7+ 49 Kg6 Nh8+ 50 Kf6 Nf7 51 Rxf7 Resigns. The “clarification” on page 614 of the October 2017 BCM refers misleadingly to my e-mail reply of 29 September to Mr Dinic. 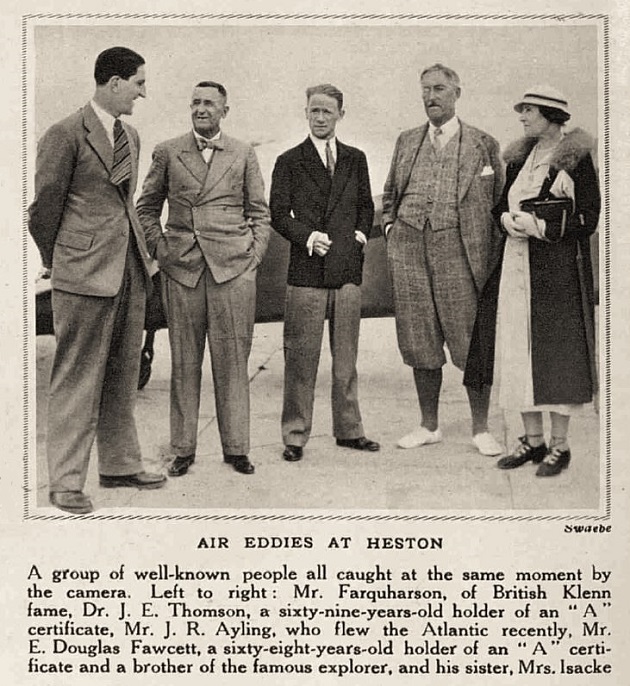 As shown by my full text (C.N. 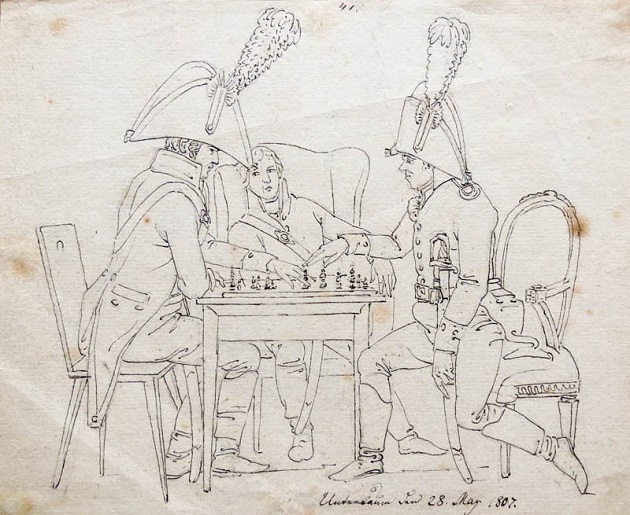 10613 at chesshistory.com), the unsigned F.D. 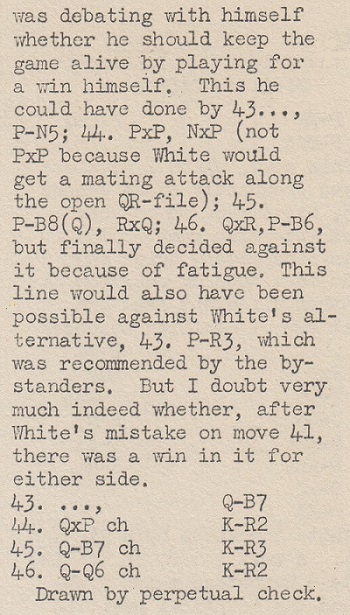 Yates article on pages 498-499 of the August 2017 BCM reproduced, word for word and without permission, an entire ChessBase feature of mine (about 700 words). No fewer than 93 lines of the two-page BCM article were written by me, i.e. about 80% of the whole BCM text. My e-mail message nominated a charity to which I asked the BCM to make a substantial donation for misappropriating my work. 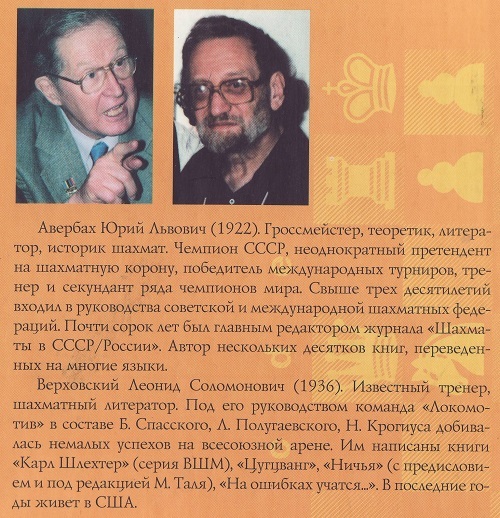 In the article about Yates in the August 2017 BCM the general introductory paragraph was lifted from Wikipedia, the other text was a copy-paste of our work, and the illustrative photograph supposedly of “Edward Lasker” was Emanuel Lasker. 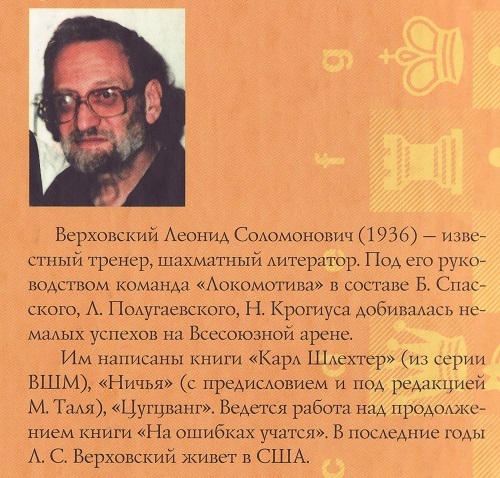 The September 2017 BCM had a ‘correction’, but only concerning the Lasker photograph blunder. Moreover, the ‘correction’ was itself incorrect, stating that the author of the article was Pete Tamburro (who had no involvement in it). On 28 September 2017 Mr Milan Dinic of the BCM sent us an e-mail message (nearly 600 words) which blamed faulty typesetting (the misuse of quotation marks) in the August 2017 article. Our response the following day stressed how much of our work the BCM had lifted without permission, and we therefore asked the magazine to make a donation to charity. No reply was received, but the October 2017 BCM published a ‘clarification’ which offered no clarity at all, contradicted Mr Dinic’s message to us and misrepresented our message to him. Our letter of 17 October 2017 having been ignored, the BCM is still concealing from its readers its gross misappropriation of our work. 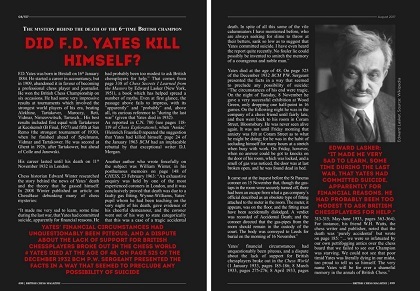 The magazine’s own contribution to the two-page spread on Yates was virtually zero. 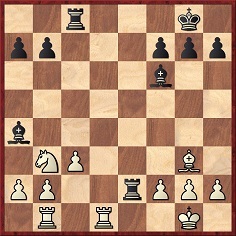 1 e4 e5 2 Nf3 Nc6 3 Bb5 Nf6 4 O-O Nxe4 5 d4 Be7 6 Qe2 Nd6 7 Bxc6 bxc6 8 dxe5 Nb7 9 Nc3 O-O 10 Re1 Re8 11 Qc4 Nc5 12 Ng5 Bxg5 13 Bxg5 Qxg5 14 Qxc5 Bb7 15 Qb4 Rab8 16 f4 Qg6 17 Qe4 Qxe4 18 Nxe4 Re7 19 Nc5 d5 20 exd6 Rxe1+ 21 Rxe1 Resigns. 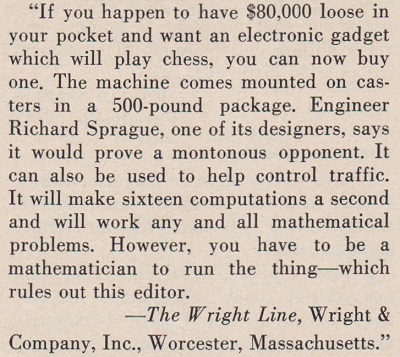 Source: Western Times, 25 April 1902, page 12. 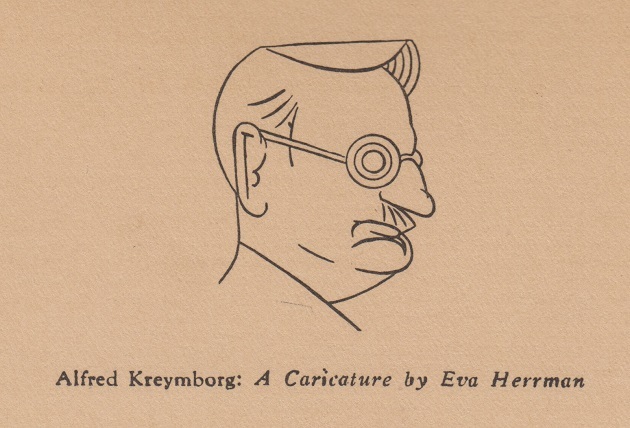 The book’s translator was Theodore Reich. 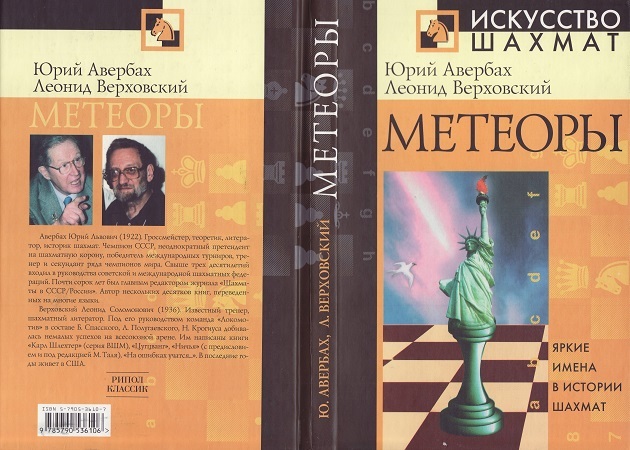 It is again stated that Verkhovsky was resident in the United States and that he was born in 1936. 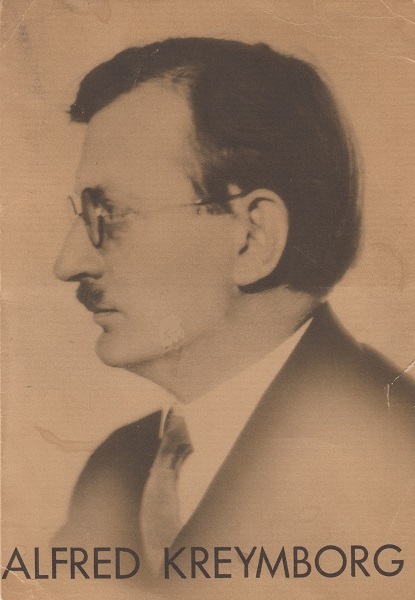 However, our correspondent notes that according to page 55 of Шахматная еврейская энциклопедия by Igor Berdichevsky (Moscow, 2016) Verkhovsky was born in Moscow on 26 December 1938. Eduardo Bauzá Mercére (New York, NY, USA) sends two photographs (references: AR_AGN_DDF/Consulta_INV: 126775 and AR_AGN_DDF/Consulta_INV: 126774) from Argentina’s Archivo General de la Nación, courtesy of the Ministerio del Interior, Obras Públicas y Vivienda. 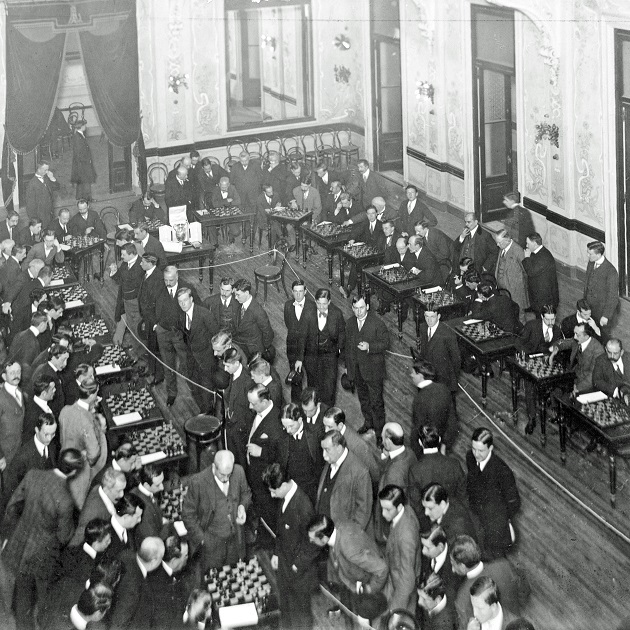 They show simultaneous exhibitions by Capablanca in Buenos Aires on 7 May 1911 (30 boards) and 29 June 1911 (40 boards). 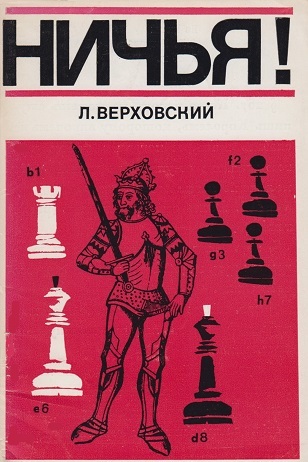 Richard Reich (Fitchburg, WI, USA) notes that other little books (not involving Fischer) in Michael Basman’s ‘Turnover Chess’ series were shown in an entry dated 13 January 2016 at the Chess Book Chats website of Michael Clapham. 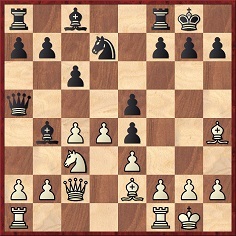 18...Rce8 19 h3 h5 20 Rd2 h4 21 Bf4 b6 22 Rxe2 Rxe2 23 Nd2 Bc2 24 Rc1 Bd3 25 Be3 Kh7 26 a4 a6 27 Rd1 b5 28 axb5 axb5 29 Nf3 Be4 30 Rd2 Rxd2 31 Nxd2 Bd3 32 Bd4. 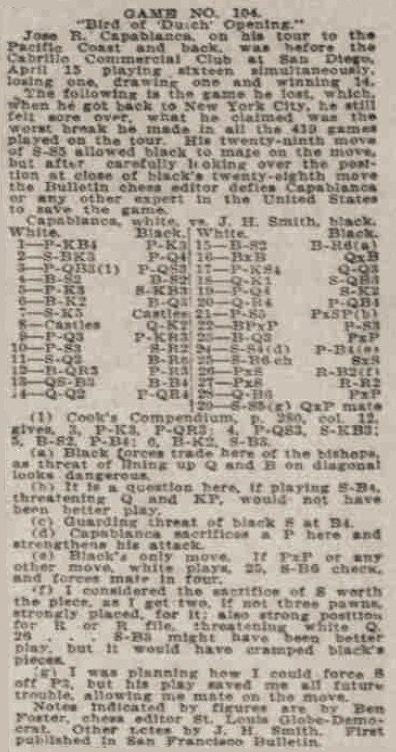 The game was adjudicated a win by Capablanca. 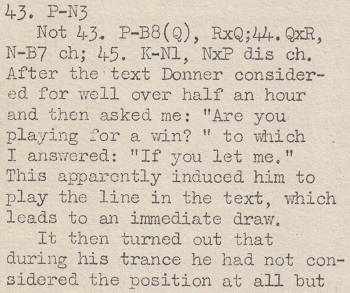 Source: a letter from Horner to John Collins dated 15 November 1970. The game was played at the Franklin Chess Club in the early 1920s. Schuyler Jackson, a friend of Horner, played alongside him. 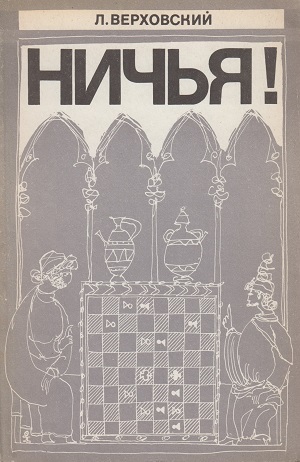 ‘Are you playing for a win?’ is a common question, and a Google Books search (without, even, the need to specify ‘chess’) provides a number of examples of the replies offered. 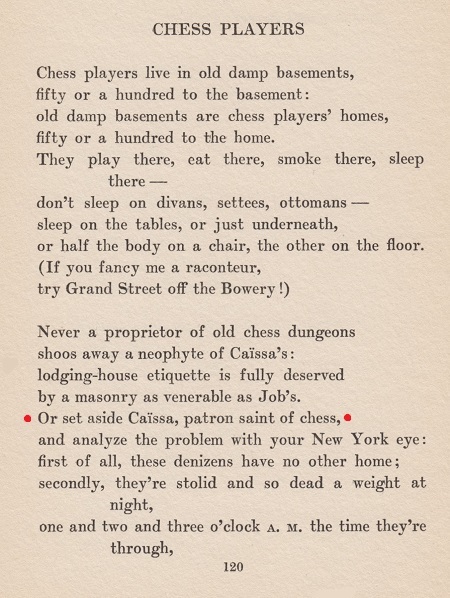 Concerning the patron saint of chess, see C.N. 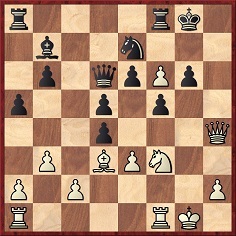 2215 (page 142 of A Chess Omnibus) and C.N. 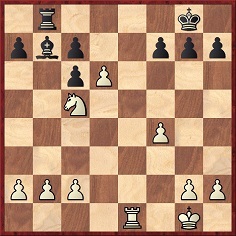 9071. 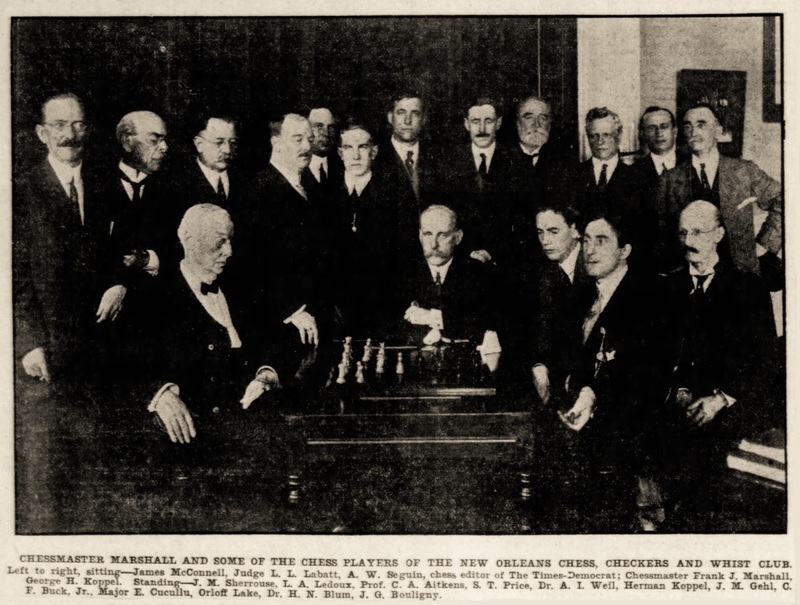 Our correspondent notes that page 102 of the May 1913 American Chess Bulletin mentioned the photograph in its account of Marshall’s visit to New Orleans. 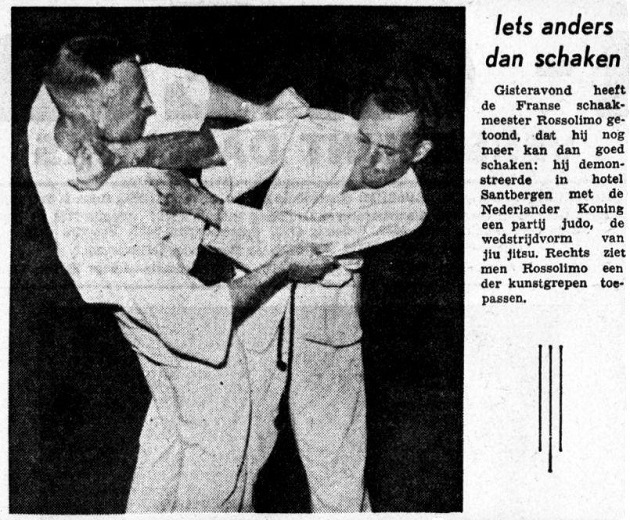 ‘Just recently Joost van Winsen brought it to my attention that a photograph of Leonard now appears in the digital collection of the Cleveland Public Library.